RaceRocks founder Scott Dewis (left) with Project Resolves' Spencer Fraser. Inc. to act as the tier-one training provider for the Royal Canadian Navy’s Resolve-class auxiliary oiler replenishment (AOR) ship, MV Asterix, which is now under conversion at Chantier Davie Canada Inc. in Quebec. RaceRocks had previously signed a letter of intent (LOI) with Project Resolve in September 2015. The LOI allowed RaceRocks to commence its activities and collaborate with Project Resolve on planning the training requirements until the Liberal government awarded, in late November, the contract to proceed with the ship conversion. RaceRocks will now complete all activities required to deliver the requisite training systems for the Resolve-class AOR by the spring of 2017. The work will be executed by a pan-Canadian team with RaceRocks as prime, as well as with sub-contractors in Nova Scotia, Ontario, and Quebec. “It’s important to note that we did an extensive survey of the naval training service providers situated here in Canada and we determined very quickly that RaceRocks and its exclusive Atlantic partner, Modest Tree of Halifax, not only provide the most cutting-edge naval training solutions available, but are able to do so at a fraction of the cost,” Spencer Fraser, Project Resolve Inc CEO, said in a statement. Germany has announced it will be buying more Boxer armoured fighting vehicles from Rheinmetall and Krauss-Maffei Wegmann. The German Bundeswehr will buy 131 Boxer vehicles. The Boxers will be configured for an armoured personnel carrier role. Delivery is slated to take place during the period 2017 to 2020. The German military already has 272 Boxers. The Netherlands is also a partner in the cross-border Boxer program, having ordered a total of 200 vehicles. Airbus Defence and Space has received a firm order from the French Defence Procurement Agency for a further eight A330 multi-role tanker transport (MRTT) aircraft. The aircraft constitute the second tranche of the multi-year contract for 12 A330 MRTTs signed by the French Ministry of Defence in November 2014 and bring the total firm order to nine, Airbus noted in a news release. The remaining three are scheduled to be confirmed in 2018, permitting deliveries of the 12 aircraft before 2025. The first A330 MRTT will be delivered to France in 2018, followed by the second in 2019, and the remainder at a rate of one or two per year. Jim Quick, president and CEO of the Aerospace Industries Association of Canada, announced December 21 that the organization had appointed Dwayne Lucas as interim vice president of AIAC’s Pacific division while the association conducts a search for a permanent replacement for Jay Teichroeb. Teichroeb, who led AIAC Pacific since it was founded in 2013, left at the end of December. Previously the executive vice president and chief operating officer of Cascade Aerospace and a brigadier general in the Royal Canadian Air Force, Lucas is a longstanding leader in the British Columbia aerospace industry, Quick pointed out. L-3 Marine Systems UK recently announced it had been awarded a design development agreement from BAE Systems for the initial design and development activities to support ship integration of its Integrated Platform Management System (IPMS) for the UK Royal Navy’s Type 26 Global Combat Ship. Using core technology developed by Montreal-based affiliate L-3 MAPPS, the company will perform the initial design and development activities to support ship integration at its facilities in Bristol, Burgess Hill and Barrow-in-Furness, the firm noted. The Type 26 Global Combat Ships are being designed by BAE Systems for the UK Ministry of Defence to replace the Type 23 frigates currently in service with the Royal Navy. “Our advanced IPMS will enable these next-generation ships to achieve high levels of operational effectiveness under the most adverse conditions,” Roger Baker, general manager of L-3 Marine Systems UK, said in a statement. The L-3 IPMS is based on proven and survivable control systems technology that has been delivered by L-3 MAPPS to over 160 ships and submarines in 18 navies worldwide. In other news, L-3 WESCAM recently announced that a combined fleet of its MX-Series electro-optical and infrared (EO/IR) imaging and targeting systems had successfully logged close to one million flight hours on board various U.S. Department of Defense (DoD) aircraft. The 184 systems continue to actively support three key programs, with the initial turrets having been fielded in 2005, the firm noted. Currently, 27 of these turrets have logged over 10,000 flight hours each while requiring only minimal in-field servicing. L-3 WESCAM has delivered over 1,700 MXSeries systems to the U.S. DoD in support of a variety of different programs. L-3 WESCAM sustains its customer support through the continuous addition of worldwide service resources, including the strategic placement of 14 worldwide authorized service centres, numerous training facilities, and on-site field support representatives. Lockheed Martin Canada recently announced several key program milestones for the Royal Canadian Navy’s Halifax-class modernization (HCM) project. 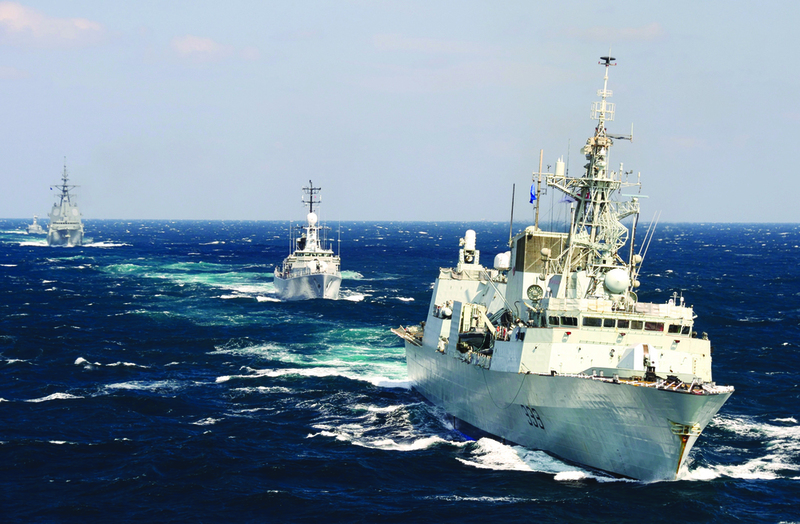 The HCM project achieved First Article Acceptance, formal recognition that Lockheed Martin Canada’s combat system design meets the Navy’s performance requirements. First Article Acceptance was preceded by an extensive series of integration tests at the company’s Maritime Advanced Training and Test Site in Dartmouth, NS, the company pointed out. Individual system acceptance of the Lockheed Martin Canada combat system has also been achieved on seven of Canada’s 12 Halifax-class frigates, the firm noted. The ships are: HMC Ships Halifax, Calgary, Fredericton, Winnipeg, Montreal, Vancouver and, most recently, Charlottetown. The frigates completed a rigorous sea trial program to validate the combat system is ready to support the RCN’s critical missions. In Halifax, QRA Corp has started work to provide Lockheed Martin engineers with an advanced early-stage systems verification solution for the proactive development of increasingly complex cyber-physical designs. The work brings together QRA Corp’s verification technology with Lockheed Martin’s large-scale system integration and design capabilities, thereby enabling QRA to push QVTrace’s rigorous analysis capabilities well beyond the level of efficiency and effectiveness of any tool before it, the firm noted in a news release. To achieve this goal, QRA will evolve and deliver QVTrace, its flagship system verification tool, which enables engineers to target and detect errors within complex systems throughout the development cycle. By proactively ensuring critical system designs always satisfy their requirements, QVTrace will help Lockheed Martin engineers avoid costly reworks and potential catastrophic deployment failures by eliminating errors at the early stages of design, thus increasing systems confidence, reducing costs, and accelerating time to market, says QRA. Seaspan announced in early January that Ian Brennan has joined the firm’s Vancouver Shipyards (VSY) as vice president of Supply Chain Management & Contracts. As part of Seaspan Shipyard’s executive team, Brennan will provide the strategic leadership and day-to-day oversight and direction of supply chain, warehousing and logistics, procurement, and contracts and subcontracts in support of new vessel construction at VSY. Brennan has more than 27 years of experience in the shipbuilding and heavy project construction industries, and has worked on a number of major military procurement programs with Aircraft Carrier Alliance, BAE Systems Surface Fleet Solutions Inc. as well as Saint John Shipbuilding Limited. Airbus Helicopters has delivered the first of Sweden’s NH90 aircraft configured for anti-submarine warfare duties. In total, 18 helicopters will be delivered. The fully qualified rotorcraft has an entirely customized mission system including underwater sonar, tactical radar and high cabin for improved interior space.